Hydraulics Underground! | HANSA-FLEX Hydraulics Canada Inc.
With a land area of close to ten million square kilometres, Canada is the second largest country on the planet. Toronto, the capital of the province of Ontario and home to 3.5 million inhabitants, is the country’s largest city. It is located on the north-western shore of Lake Ontario, the smallest of the five Great Lakes of the North American continent. In the last few years, the surrounding area for this metropolis has witnessed enormous population growth. 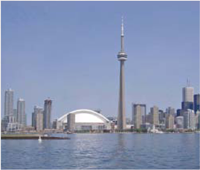 Today, the Greater Toronto Area (GTA) is home to 6.5 million people. In order to be able to keep pace with this rapid rise in population, in June 2007 the provincial government passed a resolution in favour of the “MoveOntario 2020” programme. As part of this programme, many projects associated with the transportation infrastructure in the Toronto-Hamilton urban area will be completed. One important part of this is the extension of the Yonge-University – Spadina subway in the Northwest of Toronto. The first section of the Toronto Subway was opened back in 1954. This makes it the oldest subway in the country. The four lines of the Toronto Subway network run for a total of 68.3 kilometres between 69 stations. Every day, almost a million passengers make use of this public transportation system. Now, the line that is being extended is the same one that first went into operation in 1954, and with a current length of 30.2 kilometres it is already the longest in the city. Construction work began in November 2009. by 2015, it is planned to add another 8.6 kilometres and six stations to the northwestern end of the line. From the current end station, Downsview, the extension will pass through the campus of York University and continue on to Vaughan. the Yonge-University – Spadina Line is also going to be extended. In all, four tunnel boring machines are burrowing through the ground beneath Toronto. Some of the works are being carried out with the “cut and cover” method, in which pits are dug out first and filled in again later. The construction work is being carried out using two different methods. Most of the line extension work is being done using earth pressure balance tunnel boring machines, while the stations are being built with the “cut and cover” method. The extension of the subway line involves boring two parallel tunnels – one for each direction of travel. For this, the construction teams are using earth pressure balance tunnel boring machines built by Caterpillar. These excavate tunnels underground but cause minimal disturbance on the surface. There are four of these construction giants at work on the project now. They have been christened Holey, Moley, Yorkie and Torkie. A pit had to be excavated to serve as a “launch shaft” large enough to allow these behemoths to begin working. From here, they tunnel through the subsurface until they reach their end point, where they reach another pit, the “extraction shaft”. The material that is removed as the machines are tunnelling is transported to the “launch shaft” on a conveyor system, loaded onto dump trucks and taken away. While Holey, Moley, Yorkie and Torkie are advancing steadily underground, heavy transporters bring prefabricated tunnel segments up to the construction site. These are then installed in the section that has just been bored, and will lend the future subway line its final shape. In order to keep to the tight building schedule, the earth pressure balance tunnel boring machines are at work 24 hours a day, seven days a week. Once they reach the “extraction shaft”, the machines will be disassembled by experts. They will then be loaded onto heavy transporters and delivered to the next “launch shaft”, where work will begin again. 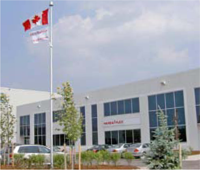 The HANSA-FLEX branch in Concord is just two kilometres from Toronto. To cope with the immense scale of this construction work, a consortium was set up and orders have been awarded to many different construction companies. Practically every one of these companies relies on the services of the HANSA-FLEX branch in Concord, Ontario, which is located just 2 kilometres north of Toronto. From here, the construction sites can be reached within 20 minutes. “Over the last four years we have built up excellent relationships with the machine operators. In most cases, we are the only company that is able to guarantee reliable and rapid delivery of spare parts for all of the machines working at the sites”, declares Diana Dahnz, President and Managing Director, HANSA-FLEX Hydraulics Canada Inc. The HANSA-FLEX branch in Concord keeps a stockpile of hydraulic and industrial hoses, fittings and a wide selection of hydraulic connection items in order to be able to satisfy all of its customers’ requirements and specifications. As a consequence of the enormous selection of over 10,000 different products it keeps in stock, HANSA-FLEX Hydraulics Canada has now become the largest provider of these products in the region. With the aid of X-CODE, our unique and fast product identification system, which is used without exception throughout Canada, customers can order the hose lines they need with ease, saving themselves laborious measurement effort. This enables replacement hoses to be produced promptly upon receipt of the call. Since the individual construction sites are so close, the customers often collect the items they need in person. “But if it has to be really fast, we will also get an employee or a courier to deliver the part to the customer by hand”, says Diana Dahnz. With a strong team, committed unwaveringly to the maxim “Service Comes First”, and many years of experience in all aspects of hydraulics, HANSA-FLEX Hydraulics Canada is equal to even the largest projects. “Our objective is really quite simple. We want to satisfy all of our customers efficiently and as quickly as possible. Because when our customers have no concerns when it comes to machine maintenance, then neither have we”, Diana Dahnz explains the spirit of service as practiced at the heart of the HANSA-FLEX group. With this attitude, the on-time completion of the subway extension will certainly not be threatened by questions of hydraulics.